CNG: eAuction 427. KINGS of MACEDON. Alexander III ‘the Great’. 336-323 BC. AR Drachm (16.5mm, 4.32 g, 10h). Lampsakos mint. 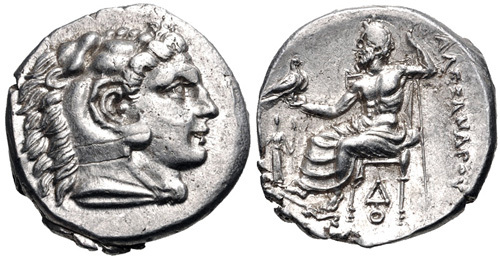 Struck under Kalas or Demarchos, circa 328/5-323 BC. 427, Lot: 13. Estimate $200. KINGS of MACEDON. Alexander III ‘the Great’. 336-323 BC. AR Drachm (16.5mm, 4.32 g, 10h). Lampsakos mint. Struck under Kalas or Demarchos, circa 328/5-323 BC. Head of Herakles right, wearing lion skin / Zeus Aëtophoros seated left; in left field, Artemis Phosphoros standing facing, holding two torches; monogram below throne. Price 1356; ADM II Series V. EF, lightly toned, underlying luster, flan flaw on obverse, minor double strike and light scratch in field on reverse.